"Not funny" — Tesla shareholders, probably. Elon Musk: Entrepreneur. Innovator. Humanitarian. Contender for the worst April Fool’s joke of all time. Good one, Elon. Except that maybe… this Tweet was a bit too prescient. 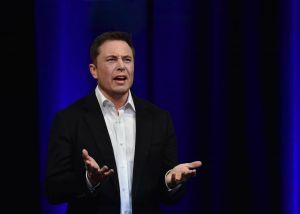 The next day, Tesla’s stock fell 7 percent, dropping to $248 per share. That’s a 36 percent decrease from the company’s peak value of $389, which it hit last summer. Whether the drop was a reaction to Musk’s April Fools’ prank or simply the market doing its thing, no one can say. But if comedy is all about timing, Musk’s was too soon. Seriously! Obviously, I’m not going to do an April Fool’s joke about going bankwupt if I thought there was any chance it would actually happen (sigh). Maybe next year Elon should pick something else to joke about on April Fools’ Day.